Helm Transport Familiarity, Combat Piloting Fly the ship. Sorry. Tactical Combat Skill Levels, Penalty Skill Levels Fire the Lasers! 1 This is not a comprehensive list - use your imagination. A Vehicle’s effective SPD in combat equals its SPD or the driver’s SPD, whichever is lower. A vehicle driven by an untrained pilot is at half DCV. A vehicle's DCV can only be halved once - even if an untrained pilot is flying at non-combat speeds. Velocity based DCV is located in 6E2 p.24. The vehicles OCV is halved if piloted by an untrained character. Attacks with the vehicle's weapons are made with the vehicle's OCV. Vehicles that take damage slowly fall apart. 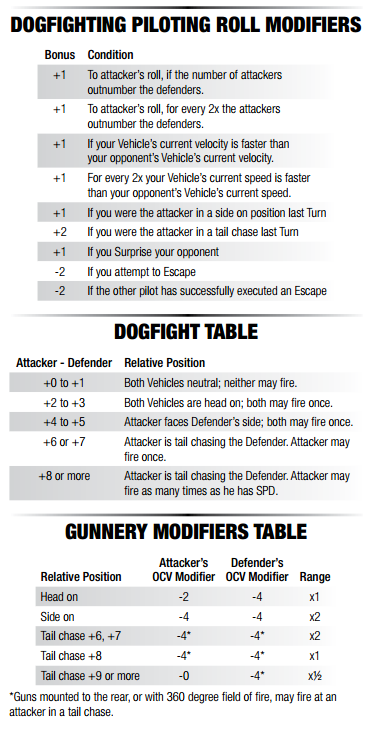 Each time a Vehicle takes BODY from an attack, the GM should roll on the Vehicle Damage Table to determine the effects. When a Vehicle has lost all of its BODY it falls apart, or blows up, at the GM’s option. 1 One 2x Noncombat Movement multiplier. 2 10m of Combat Movement. A driver can change the distance between the Vehicles or lose a pursuer by succeeding in a Combat Driving Versus Combat Driving contest. Vehicles can enter dogfight combat when the distance between them is less than their combined MAX. Dogfights are conducted in full turns. There are four different positions in a dogfight: neutral, head on, side on, and tail chase. If neither pass, position is "neutral". The pilot who succeeded the greatest becomes the attacker. Attacker and defender may be able to attack based on table. Range = Attacker's current velocity. 1-6 "escapes" are necessary to escape dogfight combat. 1 represents chaotic combat, 6 represents open space. To escape, a pilot declares "escape" at the beginning of the round. If the escaping vehicle wins the roll or ties, the escape has succeeded. Once the requisite number of escapes has been met, dogfight combat ends and intercept combat begins. Vehicles can enter intercept combat when the distance between them is greater than their combined MAX. When flying at each other, or exiting a dogfight. GM defines the range between the two targets. GM determines vehicles' intercept velocities. Positive intercept velocity means moving toward the enemy, negative means moving away. Intercept velocity is plus or minus the vehicle's velocity (MAX). The intercept velocity of a jinking vessel is 0. 2. Determine facing of vehicles. 3. Determine range of vehicles. Subtract each ships intercept velocity from the range. A ship may fire each of its weapons once per intercept turn. 5. Repeat steps 1-4 until both vehicles break off or are out of detection range.